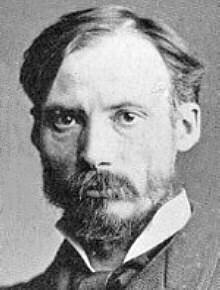 Pierre-Auguste Renoir (pyehr-oh GOOST ruh NWAHR) was born in Limoges, France, the son of a French tailor. He was one of seven children in the family. When he was four years old the family moved to Paris to an apartment near the royal palace. As he grew up he sang in the church choir. He had a beautiful singing voice. His teacher thought he should become an opera singer. When the music teacher at school tried to teach him music, he just spent his time making drawings on the music books. He next began to paint fans for a living. The ladies used these fans to fan themselves when they became too warm. Then he painted window shades to look like stained glass windows. It seemed that he would never have a chance to become a real artist. His first experience with painting came when he started to work for a porcelain maker who made fine dishes. Since their 13 year old boy wanted to be an artist, Pierre's parents thought this would be a good job for him, so the apprenticed him to work in the porcelain factory. During the four years he spent there he learned to paint flowers and scenes on ceramic objects such as cups and saucers. When they mechanized the factory he was no longer needed there. He became a copyist at the Louvre art museum in Paris. A copyist could go to the museum and copy the works of the master painters which hung in the museum. 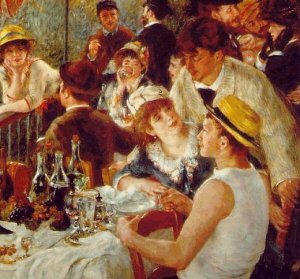 He could paint very quickly and got jobs decorating more than 20 cafes in Paris. Finally he was able to go to an art school. 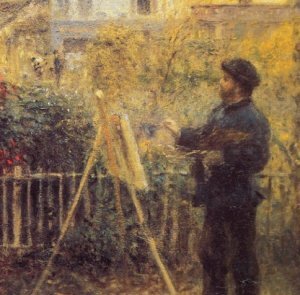 He became friends with other artists such as Monet, Sisley, and Bazille. Sometimes he included his friends as subjects in his pictures. Frequently they painted outdoors in the open air. This was called "en plen air" painting meaning "in the open air". Money was scarce and this group of "starving artists" helped one another get food and supplies. They spent most of their money buying paint. 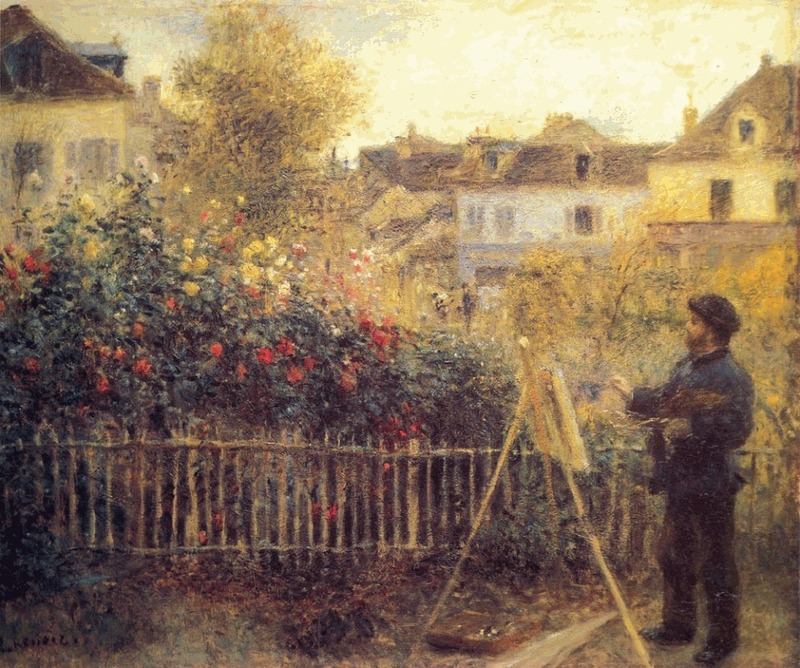 They developed a style of painting known as Impressionism. In 1874 they decided to have their own art show. Someone started calling their paintings impressionistic because they titled some of their paintings as Impression, Impression of Sunrise etc. That person didn't really mean it as a compliment, but the name stayed with them. Sometimes people showed their displeasure with the impressionistic art by creating a ruckus at the exhibits. The "Salon" was an exhibition in France in the 1700's and 1800's. To have your artwork accepted by the Salon helped an artist to become successful. 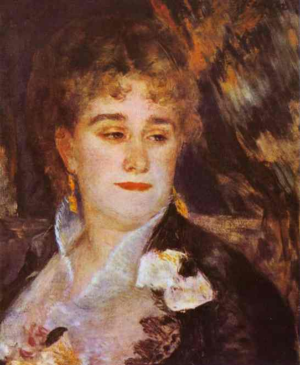 Renoir had several paintings accepted by the Salon. Among those accepted was Madame Charpentier and Her Children in 1879. The Charpentier family had to pose 40 times for this painting. The youngest child sitting by the mother is Paul, her son. He looks like a girl. Some people at that time dressed little boys in girl's clothing and let their hair grow long. His painting of the family became one of his most famous works. The painting Dance at Le Moulin de la Galette (Dance at the Moulin Rouge) has an interesting dapple-light effect. It looks as if light is shining through the trees. The specialty at the Moulin was pancakes (galettes) hence the name of the painting. In 1990 the painting sold at auction for 78.1 million dollars, one of the most expensive ever sold. The Charpentier family befriended him and helped him financially. In return he painted portraits of the family. Before his death, he was able to see his Portrait of Madame Charpentier (shown below) hanging in the famous Louvre art museum where so many years before he had spent hours copying the paintings of other master painters. 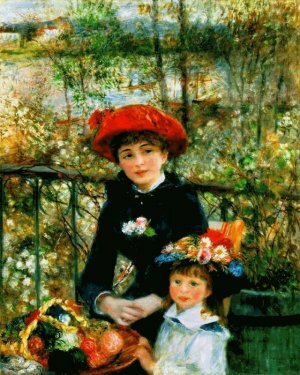 Renoir and Monet were friends and often painted together. The third picture is a painting he made of Monet painting in his garden. His style of painting used bright colors, and the artists, rather than mixing the colors, would use quick brush strokes with the different colors, and the eye of the person viewing it would "mix" the colors. These artists worked out in the open and tried to show the effect of light on the colors. They observed how objects would change color as the sun moved across the sky. 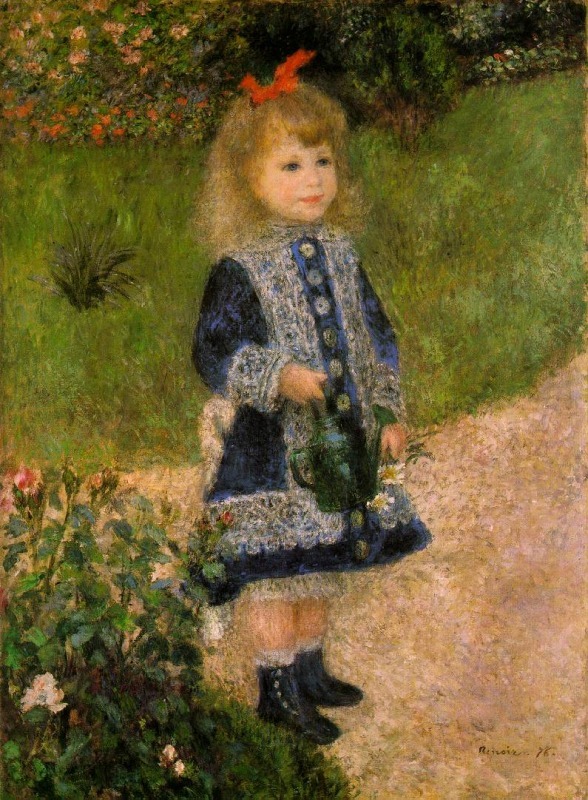 Renoir thought a picture should be "a pleasant thing, joyful and pretty" and his work reflected this philosophy. Two Young Girls at the Piano was painted in 1892 at the request of the French government to be placed in a new art museum in Paris. 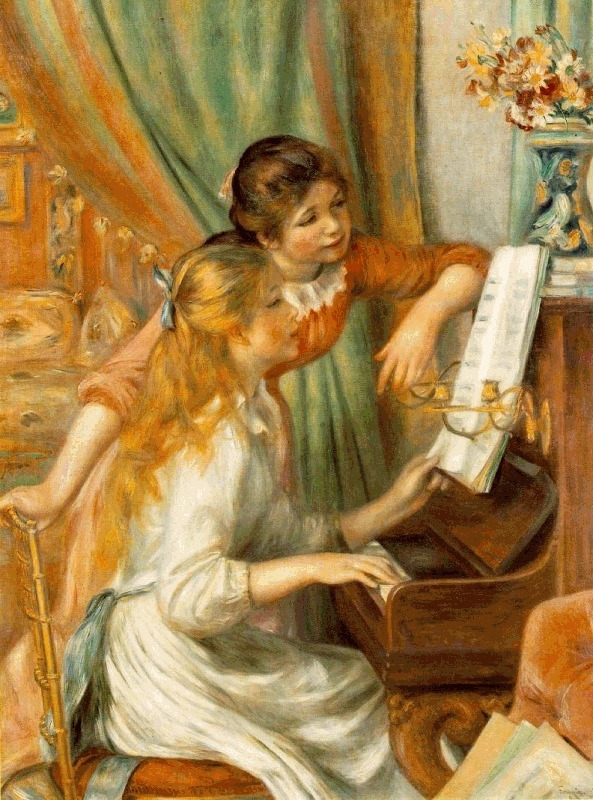 Renoir worked carefully to make it as beautiful as possible. 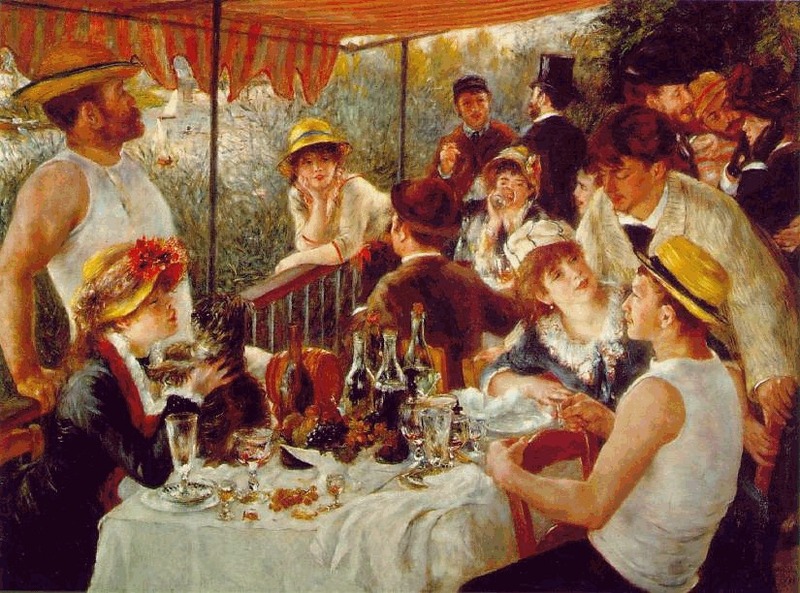 Luncheon of the Boating Party shows a group of friends having lunch on a balcony. The girl holding the little dog is Aline Charigot, Renoir's model, who later became his wife. The two girls modeling for The Two Sisters (On the Terrace) were actually unrelated. When he was 40 years old, Renoir married one of his models Alice Charigat who was 17 years younger. They had three sons, Pierre, Jean, and Claude. 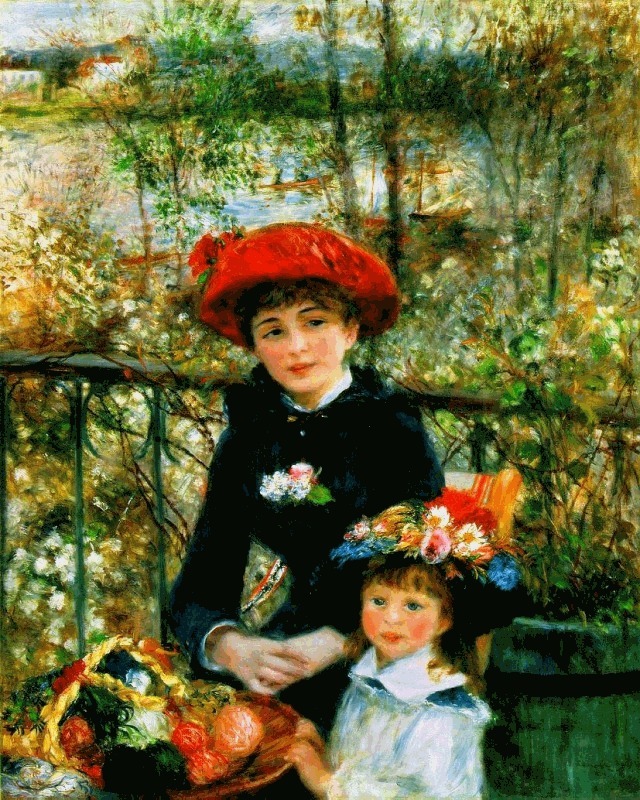 Renoir, now a family man, began painting scenes of families and spending more time with his own family. He was protective of his children. He even cut off the corners of the table and smoothed the edges so his boys wouldn't hurt themselves on the furniture. Aline's cousin Gabrielle came to live with them and was a nanny for their boys. As he became older he began to suffer from rheumatoid arthritis (rheumatism) which eventually crippled him. Sometimes he used two sticks for walking and at other times he used a wheelchair. It was difficult for him to hold a paintbrush and he had to strap the brush to his hand. He called it "putting on his thumb". Since he couldn't change brushes easily, he would dip the brush in turpentine to clean it and continue painting. Gabrielle wrapped his crippled hands in powdered gauze and his son Claude helped him by putting his paint brushes between his fingers when he could no longer pick up a brush. In spite of his handicap he could still make beautiful paintings. Later he had a stroke which left him partially paralyzed. Many artists have overcome great handicaps to make beautiful pictures. Will Pardee, who is paralyzed, draws with a pencil in his mouth. Joni Eareckson Tada paints with a brush between her teeth. All things are possible. Toward the end of his life, he began to experiment in sculpture. He could not use his own hands to model, but he used assistants to do the work and he told them what to do. 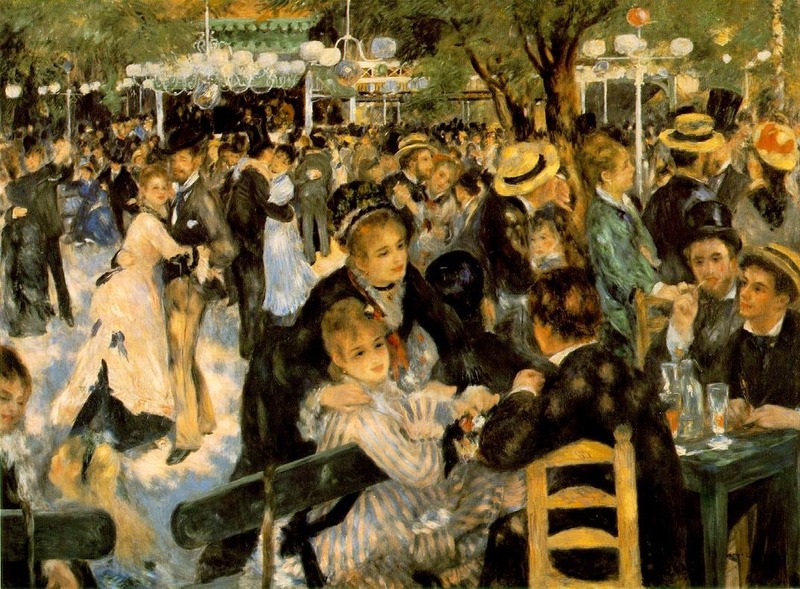 Renoir painted every day and during his lifetime made about 6000 paintings. He died of pneumonia at the age of seventy-eight. Kelley, True. Pierre Auguste Renoir. New York: Grosset and Dunlap, 2005. Gerlings, Charlotte. 100 Great Artists, New York: Gramercy Books, 2006. Cunningham, Antonia. Impressionists, Bath: Parragon Publishing Book, 2000. 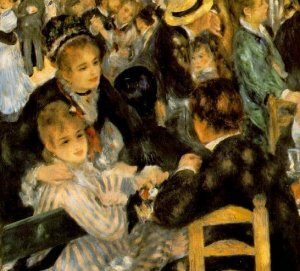 Press "Go" to search for books about Renoir. This information and fun activities for Renoir are amazing! Great website! This page displayed 503,382 times.